The best of the Peninsula It doesn’t matter what kind of fun you’re after, White Rock and South Surrey have endless possibilities all year long. From fast-paced sports games and picturesque beaches, to familyfriendly community events and numerous public parks, this area has it all. Shopping is at its finest in White Rock and South Surrey, with an abundance of unique stores specializing in fashion, home interior, garden, automotive, gifts and more. Take a look through the pages of this guide. 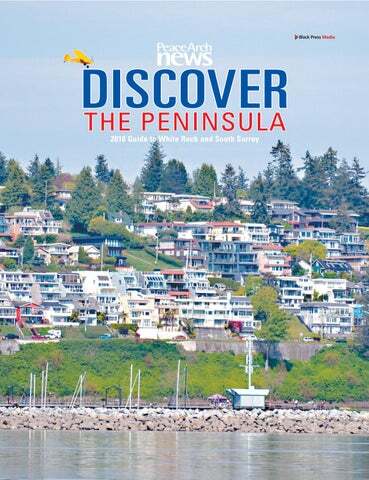 The quick page reference puts the best of the Peninsula right at your finger tips. Editorial is copyrighted and may not be reproduced without written permission. The publisher shall not be liable for typographical errors that do not lessen the value of an advertisement. 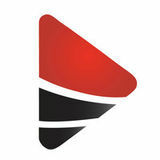 The publisher’s liability for other events or omissions in connection with any advertisement is limited to publication of the advertisement in any subsequent issue or the refund of any monies paid for the advertisement. *Does not include bottomless pop. Even high winds – which cause choppy waters – can't keep locals and tourists alike from White Rock beach. unsurprisingly, the promenade and pier. “Most people are coming down for leisure activities and tied to that are festivals and events, as well as the culinary or dining options,” she said. West Beach is undergoing renovations, of sorts. Major projects underway are the Memorial Park upgrades, situated at the foot of the pier, and a waterfront parkade at the corner of Vidal Street and Victoria Avenue. “Parking is always a hot topic and a lot of residents, as well as visitors, complain about the parking. I think the new washroom facilities will be great and I think the new Memorial Park will give a different vibe and it’s a great place to hold additional events and festivals,” James said. work also returned the historic former Great Northern Railway station to its original 1913 configuration, including a glassed-in breezeway – which serves as the gift shop area, while linking Marine Drive and the waterfront. The museum cycles new exhibits on a quitefrequent basis. The latest to be presented, Irene’s Place: An Inquiry into Legacy and Change in White Rock, follows the story of Irene Maccaud, who lived in White Rock from 1950 until her death in 1978. She tried numerous ways to leave behind a lasting legacy, and while some of her antics seem far-fetched, or even insane, the exhibit asks visitors to draw their own conclusions of her methods. Irene’s Place, which opened May 18, will continue until Oct. 8. Whether you are looking to improve your quality of sleep, reduce your blood pressure or prevent and overcome health concerns, we can help. We will teach you how to exercise safely and coach you to adopt a healthier lifestyle. Arena (2199 148 St.), Centennial Arena (14600 North Bluff Rd.) and Cloverdale Arena (6090 176 St.) – minor-hockey players will lace up their skates from the fall until next spring. The BC Hockey League's Surrey Eagles are a major draw at South Surrey Arena, and are coming off their first playoff appearance in a number of years; the team advanced to the second round this past season. For more on the Eagles, visit www. surreyeagles.ca or, for information on the BCHL, visit www.bchl.ca Elsewhere on the hockey front, the junior 'B' White Rock Whalers are set for their inaugural season this fall. The team – which will play in the Pacific Junior Hockey League – will play out of White Rock's Centennial Arena, and is owned by longtime Semiahmoo Peninsula businessman Ronnie Paterson. HAPPILY FEEDING THE COMMUNITY FOR OVER 20 YEARS! led the SFN from 1963-1996. Other well-known artists among the SFN’s 99 registered members include Roxanne Charles – who is also one of the band councillors – and brothers Leslie and Leonard Wells. Leslie helped carve the Salish house post and Haida totem pole that stand in Totem Plaza. with purchase of any Burger at regular price Valid only during Car Show Times. (May 2 to Sept. 5, 2018 – 5pm - 8pm) at 2303 King George Blvd. location ONLY. No Cash Value. One Coupon per customer. Price plus tax. Valid only during Car Show Times. (May 2 to Sept. 5, 2018 – 5pm - 8pm) at 2303 King George Blvd. location ONLY. No Cash Value. One Coupon per customer. Price plus tax. Parks offer options for everyone For those craving looking for a place to have some fun in the sun, the Semiahmoo Peninsula offers a host of parks for residents and visitors alike to enjoy. Whether it’s natural beauty, playgrounds, views, waterfront access or pet-friendly spots, there is something for everyone. White Rock alone has more than a dozen parks to choose from, while offerings in South Surrey range from staircases that lead to the shoreline, to sites where Fido can frolic leash-free. Barge Park 13689 Malabar Ave. A place to relax with a good book while children play on the playground. Bayview Park Marine Drive and Bay Street Located at the west end of White Rock’s popular Promenade, this is a perfect site for an outdoor meal with the family. Pack a picnic basket, spread out a blanket and enjoy. South Surrey's Blackie Spit park is a popular spot during the summer months. shaded forest trails for a serene experience. Cloverdale Athletic Park 6330 168 St. This 20-plus hectare park offers sports fields, playgrounds, a water park, a bike park, picnic area, washrooms, ball diamonds, games court, lacrosse box, tennis courts and walking paths. 5448 148 St. Play some tennis or have a picnic in this 2.8-hectare Panoramaarea park. Located south of Highway 10, it also features a playground and nature trails. 2610 128 St. This park offers sports fields, baseball diamonds, a bridle path, fitness track, picnic areas, playgrounds, walking trails and tennis courts. Small ponds on the west side are a draw for ducks and kingfishers. 15150 Russell Ave. Picnic tables and a meandering walkway make Bryant Park one of the White Rock’s hidden jewels. Located between Russell and Thrift Avenues, the park is also dogfriendly, but on-leash. 6220 184 St. Enjoy a recreation centre, youth centre, playgrounds, sports fields, games court, volleyball court and walking paths at this park. physicians – offers more than two acres of beautifully landscaped green space and gardens. The Glades 561 172 Street The Glades covers 15 acres – the original plantings cover a five-acre garden, and contain over 1,600 mature rhododendrons – some more than six metres high – azaleas and companion plants. The garden contains many trees, some of which are designated as heritage. Grand Chief Bernard Charles Memorial Plaza Marine Drive and Cypress Street A popular spot on Marine Drive’s East Beach, the plaza, located on traditional homeland of the Semiahmoo First Nation, is best known for two totem poles, designed by Haida artist Robert Davidson and Coast Salish artist Susan Point. White Rock Promenade and Pier Marine Drive between Maple and Bay streets With an ocean view, stunning sunsets and a continuous, wheelchair-accessible promenade stretching 2.2 kilometres, there’s something for everybody. Peace Arch Elementary Park 15877 Roper Ave. This park features a wheelchair-accessible playground, complete with swings, slides and monkey bars. The fields are ideal for an afternoon of sports. South Surrey Athletic Park 148 Street and 20 Avenue Not only does South Surrey Athletic Park offer facilities for soccer, football, rugby, baseball, tennis and volleyball, it also features a variety of pathways and walking loops for walkers and joggers and a BMX bike park. And for the kiddies, a water park (from late May through late September) offers a cooldown that is a barrel of fun. Sunnyside Park 15455 26 Ave. This park is a great place to take the kids, especially during the softball season when ball diamonds are full. The park also hosts an outdoor pool, two playgrounds, picnic areas, a soccer field, tennis courts and walking paths. Tamanawis Park 12601 64 Ave. This park – a part of the Serpentine Greenway that connects all of Surrey – features two artificial turf fields, ball diamonds and more. ••• If you’re particularly interested in places to explore the natural environment while stretching your legs, there are a handful of places to visit that offer scenic, winding and sometimes challenging trails. Blackie Spit 3136 McBride Ave. Popular amongst naturalists and bird-watchers, this park features a fenced off-leash dog area and dog beach, picnic area, washrooms, trails and walking paths. park, with more than three acres of forest, is a pristine place for a walk in the woods. As a bonus, the trails provide access to White Rock Beach. Dogwood Park 13485 20 Ave. A mainly natural area, this site is home to a partly fenced off-leash dog area, nature trails and park shelter. It connects with Chantrell Park, Bridlewood Park and Huntington Park, and is a natural extension of the Sunnyside Acres Urban Forest. Duprez Ravine in White Rock’s Centennial Park 14600 North Bluff Rd. A popular spot for fitness enthusiasts, offering a partially staired path that leads through the forest to Marine Drive. Elgin Heritage Park Crescent Road at 137 Street With 16 hectares of undeveloped parkland and home to Historic Stewart Farm, this jewel along the Nicomekl River is a great destination for those looking for a scenic walk or the opportunity to take in a little history. features five kilometres of hiking trails and the largest stand of redwood trees north of California. Semiahmoo Trail 20 Avenue/151A Street and 144 Street/Crescent Road This gem was first used during the Gold Rush, and was later established by European settlers, becoming the main wagon route between Blaine and Fort Langley. Listed on the Canadian Register of Historic Places, the eightkilometre stretch of the trail is a path running from the Nicomekl River south to 20 Avenue. Serpentine Fen 4600-block of King George Boulevard Managed by the B.C. Ministry of Environment, Lands and Parks, this spot is great for exploring wildlife habitats for waterfowl, birds and more. It includes bird-watching towers as well as trails. Sunnyside Acres Urban Forest 2598 144 St Take a long walk through this second-growth forest abundant in giant hemlock, cedar and spruce. The woods span 124 hectares and are home to a collection of wildlife, from birds and coyotes to black-tailed deer. It was declared an ‘urban forest’ in 1988 and is treasured by many who continue to work tirelessly to ensure it will be here to enjoy for generations to come. 1001 Steps 12500-block of 16 Avenue This gorgeous spot features nature trails and a staircase that ends at the waterfront of Crescent Beach. Also check out 101 steps, at the foot of 24 Avenue, which has access to the waterfront from a staircase. (For more on either city’s offerings, visit www.whiterockcity.ca or www. surrey.ca). Join us for our warm and friendly hospitality and a taste of Greece. Come and enjoy our male and female belly dancers every Friday and Saturday night. Arts abound on the Peninsula The Semiahmoo Peninsula has a long history – stretching back more than 100 years to the pioneer era – of encouraging home-grown arts and entertainment, and providing venues for touring shows of interest. Both the City of White Rock and the City of Surrey support cultural development in the area – with ample opportunities to get involved, either as a spectator or a participant. City of White Rock initiatives include a pop-up arts space at Central Plaza and multicultural events in the uptown area, including ongoing art shows at the White Rock Community Centre at Miramar Village (15154 Russell Ave.) and – at the waterfront – the TD Concerts at the Pier series in July and August, the White Rock Sea Festival in August, the Moon Festival in September and the Diwali Multicultural Integration Festival in October. Semiahmoo Arts (www.semiahmooarts.com) has an important role as an umbrella organization with a physical presence in both cities – including a gallery and multi-purpose space, pottery studio and a head office at the recently expanded South Surrey Recreation and Arts Centre, as well as presenting the Get Reel film series at the White Rock Community Centre and literary events at the Pelican Rouge Café. Platinum Blonde performs at last year's Concerts at the Pier in White Rock. Semiahmoo Potters Club The Semiahmoo Potters Club, at South Surrey Recreation and Arts Centre (14601 20 Ave.), offers kiln and glazing facilities, plus sales of pottery held twice each year. Membership fees ($350 annually) give members use of club resources, including wheels. There are small fees for using kilns and glazes, however, and potters provide their own clay. The Burro, a watercolour by Audrey Bakewell, featured at Turnbull Gallery. Open mics Semiahmoo Peninsula open-mic king Dennis Peterson promotes the area's growing pool of talents through regular open-mic shows for all ages Monday nights (6:30-9 p.m) at The Roadhouse Grille, 1781 King George Blvd., and Saturday nights (sign up at 5:30 p.m.) at The Modern General Store, 3388 Rosemary Heights Cresc. Pelican Rouge The Pelican Rouge coffee house (15142 North Bluff Rd.) hosts local visual artists and two literary events sponsored by Semiahmoo Arts, Readings By The Salish Sea and the Zero to 360 open mic for authors on the second Thursday of each month, with sign-up for authors at 7 p.m.
Is Your Dry Cleaner Solvent Free? ✓ We are the only 100% green cleaning plant on the Peninsula! ✓ No solvents or harmful chemicals are used on your belongings. ✓ Our equipment emits no greenhouse gases. ✓ Your items are returned in pristine condition: soft, fresh and clean. Dentistry should look good, feel good and lasts a long time. Dr. William ( Bill ) Liang UBC Dentistry ’83. Recipient of the Canadian Oral-Maxillofacial prize for highest standing in oral surgery. After 35 years of practice, his passion is focused on implant dentistry and adult restorative services. Bill is also the Director of the American Academy of Implant Dentistry Vancouver Maxicourse, one of the largest dental implant training programs for dentist. Member of the Peace Arch/White Rock Rotary Club. Dr. Jonathan Tsang Temple University, Dentistry ’08. Jonathan believes in lifelong learning and has participated in over 100 hours of continuing education courses yearly. He is certified to provide intravenous sedation. As part of his philosophy of giving back he has volunteered in Canada, United States and Haiti. His professional focus is on implant dentistry. Dr. Kiranpal Kaur Sroay University of Manitoba, Dentistry ’03 Dean’s honour list. Alongside 15 years of private practice, she also taught for 11 years at the faculty of dentistry, University of Manitoba and participates as an examiner with the National Dental Examining Board. Dr. Sroay has made B.C. her permanent home since last year. In her spare time you can find her exploring the beauty of B.C. with her family and teaching Indian classical music. Monday - Friday: 8.00 a.m. - 5:00 p.m. Wednesday: 8.00 a.m. - 6.00 p.m.
32 incl. meals dbl: $7,199. South Surrey's Grandview Central is one of the area's busiest shopping locales. (148 Avenue & King George Boulevard) Home to Choices Supermarket, this South Surrey strip mall also includes Asian cuisine, hair salon, insurance, math tutoring and health care. designer optical store and more. (160 Street & King George Boulevard) Home to Roadhouse Grille, this plaza also features a convenience store and a men’s-only salon and spa. Central Plaza (North Bluff Road & Johnston Road) Just across from Semiahmoo Shopping Centre, it's home to several businesses, including a cafe, insurance office, and art supply store. Centre 24 (24 Avenue, between King George Boulevard and 156 Street) Home to the White Rock Hospice Thrift Store, this plaza also includes a florist, dance studio, bakery, pizzeria, book store and wine retailer. Crescent Beach (Beecher Street) A beloved destination for locals and tourists alike, this area is laced with artistic charm. An art gallery, hair salons, ice-cream and coffee shops, restaurants and yoga studios are highlights of the seaside community. Croydon Business Centre (2594 Croydon Dr.) The business centre features RBC Wealth Management, Exclusive Mortgage, a podiatrist and dental office, plus much more. (King George Boulevard) An eclectic mix of independent businesses ranging from restaurants to health and beauty care, fashion, lingerie, jewelry and more. Gateway Crossing (176 Street and 4 Avenue) Near the Pacific Highway border crossing, features a pharmacy, health care, a bistro, liquor store and fitness. Grandview Corners (160 Street & 24 Avenue) One of the fastest-growing districts on the Peninsula, Grandview Corners is a major destination with bigname retailers such as Superstore and Walmart, plus boutique shops, essential services and restaurants ranging from high-end to casual – with new stores coming in 2018. (Marine Drive) Even with ongoing construction at Memorial Park (at the foot of the iconic pier), Marine Drive continues to offer an exciting strip – particularly on sunny summer days – with a range of boutiques, gift shops, clothing stores, book stores, ice cream shops, spas and restaurants. Elgin Corners (140 Street & 32 Avenue) With a charming village atmosphere, Elgin Corners offers veterinary hospital, pet grooming, spa, organic food and home decor boutique. (15252 32 Ave.) This building offers a range of services, with physiotherapists, travel centre, dental office, laser centre, pharmacy and café. Ocean Park Shopping Centre Redwood Plaza (128 Street & 16 Avenue) This outdoor mall is anchored by Safeway and includes a children’s store, flower shop and more. (King George Boulevard & 31 Avenue) Anchored by Rona Home Centre, this strip mall features Anytime Fitness, M&M Meat Shop and more. (128 Street & 16 Avenue) Right across from Ocean Park Village is a cluster of shops, which includes casual dining, clothing, home decor, jewelry, gifts and more. (34 Avenue & Rosemary Heights Crescent) This stylish shopping complex, nestled in close proximity to Morgan Creek and Rosemary Heights, offers a range of shops and amenities. (152 Street & 56 Avenue) Featuring Big Ridge Brewing Company, Brown's Social House, A&W and two banks. Peninsula Village (15355 24 Ave.) Anchored by Safeway, London Drugs and a liquor store, this mall has more than 30 retailers. Semiahmoo Shopping Centre (16th Avenue & 152 Street) Anchored by Save-On- Foods and Shoppers Drug Mart, this mall boasts 75 shops and services. Canadian Tire and Staples, this area also features a number of shops, dental office and restaurants. South Point Annex Mall (152 Street & 29A Avenue) This destination, anchored by Kin’s Farm Market, Showshaa, Nando's, a liquor store and more. The Boulevard at South Point Exchange (32 Avenue and King George Boulevard) This great shopping spot is home to the Urban Barn, Zig Zag, Turner Shoes, Grasbys and much more. Sullivan Square (152 Street & 56 Avenue) This plaza is home to a variety of restaurants, including Tim Hortons and Dairy Queen, as well as Pharmasave, doctor's office, an insurance business and a vet clinic. Sunnyside Village (King George Boulevard & 24 Avenue) This conveniently located plaza consists of a movie theatre, restaurants, a sports gear and apparel store, camping and hiking equipment store, dry-cleaner, pharmacy and more. Uptown White Rock (Johnston Road) Banks, hair salons, a grocery store, butchers, flower shops, health food stores, an art gallery, delicatessens, book stores, clothing stores, fitness clubs and more are located along this busy street. Windsor Square Mall (152 Street & 20 Avenue) More than 50 upscale shops and services, from salons to jewelry and fashion and more, have put this shopping hub on the map. This mall also has an eco-friendly cleaner and restaurants, including Kiki's. FASHION ADDITION 14+ Celebrating Your Curves! You are invited to our Tasting Rooms where you can sample the highest quality Flavoured Olive Oils & Balsamic Vinegars in the world! Grandview Heights is home to thousands of new residents in recent years, with many more soon to be on the way. disruptive root systems (work is expected to be completed by fall). The latter work is part of the Johnston Road Gateway plan, for which council has also earmarked $1 million for construction of a decorative archway at the Johnston Road and North Bluff Road intersection to welcome visitors to the city. Council has also approved two multi-storey buildings for lower Johnston Road (south of Thrift Avenue), plus a 14-storey tower by Marcon adjacent to the existing Saltaire development (at Thrift Avenue and Johnston Road), while an application has been received for a 27-storey highrise at the site of Royal Place mall (also at the Johnston Road and North Bluff Road intersection). At OPN we provide you meticulous personal care so you can take the stage in your life. We combine health and beauty so you can indulge in an exceptional experience. We are passionate about bringing you Natural and Organic products to maintain your optimum health. We provide exclusive nails services, facial, waxing, threading, tinting and eye lash extensions. Our lovely team will impress you with friendly service that invites you to want more. Treat yourself with an impeccable experience and schedule your appointment today! JULY 9th-12th MINI CAMPS Hip Hop 6-12 yrs. JULY 16th-19th MINI CAMPS Pre Dance 3-5yrs Theme "Movin & Groovin"
43 independent garden or ocean view suites, 3 home cooked meals, weekly housekeeping & linen services, 24 hour emergency response, recreation, entertainment, transportation & concierge services. Pet Friendly! REWARD : Making a Diﬀerence in Your Community! Free shipping on orders of $49 or more. Terms & conditions apply. Easy to stay busy, year-round Events, festivals keep South Surrey, White Rock residents entertained The South Surrey and White Rock community is host to all manner of exciting events throughout the year. No matter the season, or your interests, there is always something interesting to enjoy. Here are but a few of the activities open to local residents and visitors alike – but be sure to mark your calendars so you don’t miss out on any of the fun. blanket and come tap your toes to the music of Canadian folk band Willy Blizzard at this once-only event. The Dixie Strollers perform at the 2016 World Oceans Day. produce, baked goods, garden products, handmade crafts, jewelry and more. June 3 at Blackie Spit Park Celebrate the world’s oceans and learn more about the coastline, featuring activities, food and entertainment. The event will take place from 10 a.m to 2 p.m. Visit birdsonthebay.ca for more info. Surrey’s Canada Day Celebration July 1, Bill Reid Amphitheatre, 176 Street & 64 Avenue A day full of activities and › see page 36 Dr. Emami is currently accepting new patients call & book your Implant consultation today! Grandview Corners Dental is currently accepting new patients for both Implant Placement and General Dentistry with Dr. Afshin Emami. Call today to book your appointment! The Sunday evening torchlight parade is always a spectator-friendly highlight of the White Rock Sea Festival. entertainment for the whole family, including live music, games, food and more. Canada Day Rock 10K Run July 1, 8 a.m.-12 p.m. Start your Canada Day celebrations with a 10- or five-km run along White Rock’s waterfront. Run starts at Semiahmoo Park. TD Concerts at the Pier July 5, 14, 19, 26, Aug. 11, 18, 7-10 p.m., Totem Park & Five Corners Presented by the White Rock Business Improvement Association and the City of White Rock, the summer concert series returns with live performances by Honeymoon Suite, Daniel Wesley, the Northern Pikes and more. See www. whiterockbia.com/concerts-at-thepier for show schedule. where they’ll enjoy crafts, games, face painting and more. Proceeds benefit the White Rock Fire Fighters Charity Association, raising funds for an all-abilities park in White Rock. White Rock Sea Festival Aug. 4-5, White Rock waterfront A longstanding and much-loved Semiahmoo Peninsula tradition, this family-friendly festival – which attracts upwards of 100,000 visitors each year – returns for a 68th year. Events include music, marketplace, kids’ activities, paddle board races and a torchlight parade Sunday. Great Pumpkin Run/Walk October, 21, Bayview Park This annual fundraiser for the Peace Arch Hospital and Community Health Foundation is all about fun. Participants get into the Halloween spirit by dressing up to take part in a five- or one-km run/walk. Stay tuned to www.pahfoundation.com for more information. THE LOWEST PRICE ON TIRES, GUARANTEED! may be tried three times on a drop-in basis before purchasing a membership. The annual cost of a White Rock Recreation & Culture membership – available for purchase at KSAC, Centennial Arena and the White Rock Community Centre – is $39; a three-month membership (valid for a specific three-month term) is $19.50. For those looking for a fulfilling way to spend their spare time, extra hands are always needed on the centre’s various committees, and even in the coffee shop. To get involved or for more information, call the centre at 604-541-2231. Your healthy feet will take you somewhere. All aspects of podiatric medicine, sports medicine and foot surgery. With a strong focus on long-term results and patient-education, you can fell confident putting your feet into his hands. Call or visit Dr. Green’s website today! Dr. G.K. Bains, BSc, MSc, OD, MCOptom Optometric Corp. *See store for details. Buy 1 Complete Pair - *Get 2nd Frame Free & 50% off Lenses!! rustic, vintage glam boutique and our goal is to create an inviting, comfortable and relaxed visit each and every time a customer, old or new walks through the door. We want every person to feel a part of a community, to have an experience and for us to build a relationship with each and every one of you. White Rock beach Thousands of visitors from all over flock to White Rock Beach every summer to dive from the pier, take a dip in the ocean or sunbathe. Named after the large boulder on its shoreline just east of the pier, this charming, oceanside community is located along an eight-kilometre stretch of sandy beach. The beach is always bustling with activity and excitement through the summer, especially around Marine Drive, where the sounds of music and laughter echo from the restaurant patios filled with patrons. At low tide, children build sandcastles, play frisbee and explore the marine life below the seaweed. Swimmers take note: White Rock Beach does not have a lifeguard on duty at any time throughout the year. And, pay parking is in effect – yearround, from 10 a.m. to midnight . Crescent Beach offers one of two spots in the area popular with pier jumpers. searching for crabs and more. And, it is undeniably one of the best swimming beaches in the region. Lifeguards are on duty 11 a.m. to 7 p.m. during the summer months at two roped-off areas. Swimmers should keep children within arm’s reach and be aware of currents, tides and water conditions. Dogs are not allowed on the main beach from May 15 to Sept. 15, but for those wanting to bring their fourlegged family members out, there is a designated off-leash area at Blackie Spit, at the northern tip. Another perk: free parking. dry-heat saunas and a weight room. Visit www.surrey.ca for admission rates and swim schedules. The Crescent Beach Swimming Club – using a pool and signature salt-water tank – offers a broad aquatic program with opportunities for all family members at all levels. The club is proud to offer programs that include synchronized swimming, triathlon, water polo, family and medal swims. Visit www.cbswimclub.ca. Located at 14988 57 Ave., the Tong Louie Family YMCA offers a range of swimming lessons for all ages and abilities. The facility includes a toddler pool, 25-metre lanes for swimming lengths as well as a smaller special-use pool. The Grandview Heights Aquatic Centre is home to Surrey’s newest and largest pool facilities. Opened in the spring of 2016, its features include a 10-lane, 50-metre Olympic-size competition pool, a 500-sq-m leisure pool, dive towers, waterslide, hot tubs and more. Located at 16855 24 Ave., drop-in admission is $3.50 for children and youth, and $6.75 for adults. Visit surrey.ca for information. Sunnyside Outdoor Pool As soon as the sun begins to sizzle on the Semiahmoo Peninsula, the Sunnyside Outdoor Pool, at 15455 26 Ave., becomes a haven for many. Admission is always free. The gates opened this season for public swims on May 14, with recreational and lesson times to continue till September. Call 604502-6255 for more information. Treat Your Feet to Style and Comfort FLY LONDON Style conscious women who want comfort wear FLY LONDON shoes for travel, work and play. Zig Zag offers the largest collection of FLY LONDON in the lower mainland. SOFTINOS Happy feet. New for spring; casual shoes. Perfect for travel or play. Made in Portugal. Upstairs at 2A-15782 Marine Drive, White Rock (next to WAG) COME IN TODAY! 10% OFF In Store Purchase Only. Coupon must be presented at time of purchase. scenic vistas. Both locals and visitors alike frequent the club, which also includes tennis facilities and dining. Visit www.hazelmere.com for more information . Nico-Wynd Golf Course 3601 Nico Wynd Dr. 604-535-9511 Located along the banks of the Nicomekl River within Nico-Wynd Estates, the par-70 course offers South Surrey golf enthusiasts four sets of tee blocks, which cater to a variety of skill sets and experience. Visit www.nicowynd.bc.ca for more. Northview Golf and Country Club 6857 168 St. 604-574-0324 This 21-year-old course is known for hosting the PGA Tour for seven years, and has two Arnold Palmer signature designed tracks – the 18-hole canal course and the 18-hole ridge course. For more, visit www.northviewgolf. com for information. 765 172 St. 604-541-1214 Bring friends and family out to the Peace Arch Golf Centre to relax and keep fit. Peace Portal Par 3 17065 4 Ave. 604-538-1892 Carved into a setting of beautiful, mature cedars, this par-3 course takes players up and down a gentle and scenic ridge. Though there are only nine holes, each one has two sets of tee boxes, so you can play a full 18. Sailing – both competitive or recreational – has long been popular on the Peninsula, both in White Rock and Crescent Beach. Pastor Peter Hanson All are Welcome! Your used printer is worth $50. Ask in store for details. Discount applicable on one cartridge refill per customer per visit. Value up to $10. Limit one per customer. Good for one purchase. Not valid with any other offer. Coupon must be presented at time of purchase. Minimum purchase of $10 ink or $50 toner required. Offer expires August 31, 2018. Means digital impressions, no more gagging! Dr. Miral Hassan We tailor your treatment according to your needs. NEW PATIENTS WELCOME! Please CALL TODAY to book your appointment with us. OPENING THIS SUMMER! JOIN THE MOVEMENT! Help White Rock + South Surrey be the healthiest community possible.